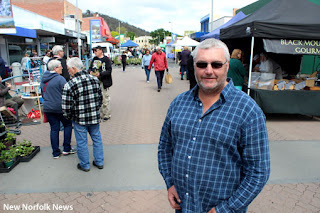 Organiser John Blegg at last week's market. ABOUT 50 stall-holders are expected to set up shop at the New Norfolk Market in High St today. Organisers say there will be a number of new players at the marketed including additional craft stalls with wood crafts, scrapbooking, gourmet oils, home decor, jewelry and soaps. Other offerings are expected to include clothing, produce, jams/preserves, cakes, plants, books and more. The market is in High St today (Saturday) from 8am-2pm. The street will be closed to traffic between Burnett and Charles Sts.